This week in Panama City, over 1,500 participants from 139 countries have come together to discuss progress made in the fight against corruption. 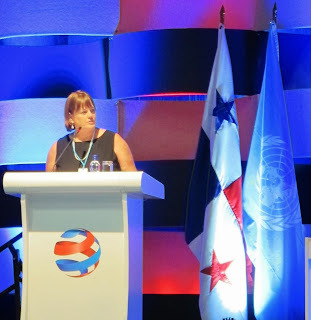 Secretary of Justice April Dawn M. Skilling is attending this fifth session of the Conference of the States Parties to the UN Convention against Corruption on behalf of the FSM. She is there together with 9 other Pacific Island Countries (Cook Islands, Fiji, Kiribati, Marshall Islands, Nauru, Palau, Papua New Guinea, Solomon Islands and Vanuatu) representing the Pacific. This is the highest representation ever from the Pacific at an international anti-corruption forum. The UNODC is the guardian of the UN Convention against Corruption to which the FSM is a State party together with 170 other countries. One of the opportunities to being a State party is an inter-governmental peer review process. This process will allow the FSM to take stock of its successes and challenges in the fight against corruption, in particular as a Small Island State. The FSM is currently undergoing this review process and its reviewers are from the Republic of Korea and Mongolia, scheduled to go to the FSM in March/April 2014 to complete an in-country visit for the review process. The fight against corruption is for future generations – everyone can do their part, including the youth in standing up and saying “no” to corruption! FSMIS (November 27, 2013): President Manny Mori and the Congress Special Committee to Wait on the President met in the afternoon of November 25th at the President's Conference Room. Appointed by Speaker Dohsis Halbert, the Congressional Special Committee consisted of Senator Wesley W. Simina, committee chairman, Senator Joseph J. Urusemal, Senator Yosiwo P. George, and Senator Peter M. Christian, who did not attend the meeting. The Committee reported that the FSM 18th Congress has begun its Third Special Session earlier this day and that Congress, through the committee, would like to engage with the President on selected agenda items that should be prioritized this session. President Mori welcomed the Committee and conveyed his appreciation for Congress’ readiness to collaborate. He also stressed that the Executive Branch will prioritize session matters for the duration of the meeting to ensure mutual satisfaction and nation-wide benefit. Both the President and the Committee highlighted some areas where actions are needed. The President had submitted a supplemental budget request in the amount of $11,450,024 before the convening of the session. Congress appropriated the FY14 budget in September in the amount of $41,653,844 -- Public Law No. 18-15. The latest FY14 revenue forecast provided by the Department of Finance is at $61,098,221. This means nearly $19.5 million in domestic revenue has not been allocated. The supplemental budget request pending at Congress is to tap this unallocated amount to provide for operation funding of certain offices such as the Project Management Unit (PMU) as well as capital projects in the areas of tourism, agriculture and investment required to “grow the economy”. President Mori also impressed upon the Committee the pressing need to pass the telecommunication reform bill, reasons for which had been discussed at length with Congress through various fora including committee hearings. Chairman Simina said Congress needs to review the bill “as cautiously as possible”. Related to the telecommunication reform bill, A World Bank grant of $500,000 awaits Congressional action. The Committee revealed that Congress had some reservations stemming from the breakdown on how this grant is to be used. Ultimately, the World Bank grant is to be utilized in a study that will result in the formulation of a telecommunication regulatory framework to put in place measures and conditions toward achieving a competitive and protected telecommunication industry with high standard service capacity. The Committee to Wait on the President also laid out a few requests from Congress. First of all, Congress wants to understand the current status of the 2023 Planning Committee. The committee was created by Executive Order No. 40 on March 3, 2012 primarily to make recommendations to State and National Leaders on a realistic action plan that will address looming budgetary shortfall for the State and National Governments and assess the post-2023 financial scenarios. The kick off meeting for the planning committee was held in Pohnpei on April 9, 2013. It will meet again next month in Saipan after the Micronesian Chief Executive Summit scheduled for December 4-6. The Committee to Wait on the President also reported that Congress would like to be more aware on the status of sea and air transportation situations. At present, the entire sea transportation services connecting the outlying islands to the State centers depend solely on Ms. Caroline Voyager, which is an FSM transportation operation. Additionally, an Airline Task Force has been exploring ways to improve air service within the country. To date, the Task Force has not provided any report on its mandate. President Mori and the Senators discussed the situation relating to the Project Management Unit, which oversees the Compact infrastructure projects. FY 2014 operation funding for the PMU Office under Compact grants had been with held by the Joint Economic Management Committee (JEMCO) for certain reasons. Moreover, Congress opted to fund only the first quarter of the FY2014 from domestic revenues, with instructions to close out the office. The President stressed that to prevent potential drastic repercussions from an abrupt dismantling of PMU, Congress needs to consider a full-year funding for the office while a careful decentralization plan is explored. President Mori was joined by Vice President Alik Alik and Cabinet Members. For more information, call the FSM Public Information Office at 320-2548 or email fsmpio@mail.fm. Cairns, AUSTRALIA. — A Pacific call for the Tuna Commission to get back to its founding promises has formed a strong part of a high-level Pacific Islands Forum Fisheries Agency meeting in Australia this week. In the build up to next week’s annual WCPFC Tuna Commission event, the FFA governing council of 17 Pacific Island states and territories has resolved to renew efforts to ensure the WCPFC’s founding commitments to Small Islands Developing States and sustainable management of Tuna stocks are met. The 88th session of the Forum Fisheries Committee (FFC 88) ended a five-day meeting at the Rydges Hotel Conference Centre in Cairns, Australia, yesterday. More discussions will take place this weekend in preparation for the 10th Western and Central Pacific Fisheries Commission (WCPFC 10) meeting, at the Cairns Conference Centre from 2-6 December. For the more than 60 participants at the FFC 88, the five days in deliberations were a taste of what is to come at the larger WCPFC meeting, which will add the distant water fishing nations and other interested parties into an already complex mix of agendas. “There has been a strong and resounding call from our member nations to take a unified focus into next week’s Tuna Commission meeting, and look at where we can grow some traction on areas of the founding Convention of the WCPFC that are important to our membership,” says FFA Director General James Movick. “These founding elements cover clauses which are becoming more urgent and relevant with every passing meeting of the WCPFC; and highlight that our concerns on disproportionate burden and the impacts of measures on Small Islands Developing States are actually key WCPFC concerns and must be dealt with accordingly,” says Movick. A new Conservation Measure for Tropical Tuna – FFA members see this as the most important item on the WCPFC10 agenda. FFC 88 spent much time discussing the multiple issues and ideas for the new Tropical Tuna Conservation and Management Measure. Members agreed to continue to support the joint PNA/Japan/Philippines proposal designed to reduce big eye tuna mortality during the period 2014-17, while still allowing for SIDS development aspirations, transfer of vessels to SIDS and increased economic benefits from the purse seine tuna fishery. FFC88 work-shopped several enhancements that will contribute to reaching suitable agreement at WCPFC10. Enhancing the WCPFC process for consideration of the Special requirements of SIDS – FFC 88 reiterated the FFA delegation papers on this issue already submitted to the WCPFC. Members endorsed the work of the Republic of Marshal Islands on a template of questions to assess proposals at the Commission to ensure there was no disproportionate burden to SIDS in their application or implementation. There was considerable discussion on mitigating disproportionate burden for SIDS when developing Conservation and Management Measures. Reductions to shark mortality rates — FFC 88 further developed the FFA proposal to reduce shark mortalities for consideration at WCPFC 10. There is clear evidence that mortality on key shark species needs to be urgently addressed, and the FFA proposal sets forth strategies that will achieve this with minimal disruption to the fishing industry. An amended measure for South Pacific Albacore – FFC 88 agreed on an approach to put in place a one- year amendment to the current CMM on South Pacific Albacore that would prevent an increase in catches, particularly on the high seas while catch limits for members EEZs are developed. A more comprehensive new CMM for SP-ALB will be developed during 2014 for consideration at WCPFC11. fundamental to ensuring good scientific analysis necessary for managing fish stocks. Closure of the Eastern High Seas Pocket – FFC 88 agreed to close the Eastern High Seas Pocket to Fishing and strengthen the arrangements for transiting vessels. This area of high seas, bordered by Cook Islands, Kiribati and French Polynesia, is suspected of being used to circumvent tighter controls on IUU fishing in the adjacent coastal states. On Monday, November 25, 2013 President Manny Mori of the Federated States of Micronesia received the Letter of Credence of His Excellency George Ney de Souza Fernandes, Ambassador of the Federative Republic of Brazil to the FSM, in an official ceremony held at the President’s conference room in Palikir. Ambassador Fernandes is cross-accredited to the FSM out of Manila, Philippines. During the ceremony, President Mori welcomed Ambassador Fernandes to the Federated States of Micronesia, and congratulated him for being the first Ambassador of the Federative Republic of Brazil to the FSM. President Mori expressed appreciation to the Ambassador for taking time to visit the FSM to formally present his credentials and indicated his desire to develop the relationship based on mutual cooperation at all levels. He also congratulated the Brazil Government for hosting the biggest United Nations Conference on Sustainable Development: RIO+20 held last year, and expressed his appreciation for the warm hospitality extended to him as head of the FSM delegation to the RIO+20. Ambassador Fernandes thanked the President for accepting his letter of credentials and expressed his desire to strengthen the relations between Brazil and the FSM. He shared views on potential areas of bilateral cooperation and engagements between the two countries, especially in the areas of environment, energy, and agriculture. Attending the ceremony were Secretary of Foreign Affairs Lorin S. Robert, Chief of Staff Leo Falcam Jr. and staff from the President’s Office and the Department of Foreign Affairs. After the Presentation of Credentials ceremony, President Mori invited Ambassador Fernandes to join him for the opening of the Special Session of the 18th Congress of the Federated States of Micronesia, where he was recognized and welcome by the FSM Congress. FSM and Brazil established diplomatic relations in 2010 with the signing of a Joint Communiqué between the two countries’ Permanent Missions to the United Nations in New York. FSMIS (November 27, 2013): On November 23, Chuuk State Governor Johnson Elimo and House of Senate President Mark Mailo met with Federated States of Micronesia (FSM) President Manny Mori in Palikir, Pohnpei. The two Principal Leaders for the State of Chuuk approached President Mori with a clear agenda over very recent issues regarding the road project on Weno Island. The road project contractor, the Pacific International Inc. (PII), had been handed a contract termination notice by the Project Management Unit (PMU) at the FSM National Government, essentially ordering PII to cease operation and move ahead with contract termination. PMU claimed that its decision was based on certain section of the contract agreement with PII which reserves the right for PMU to terminate the contract based on a determination of non-compliance and inability to ensure project completion within specified terms. At their meeting, Governor Elimo informed President Mori that the Chuuk State Leadership recently met to consider the status of termination issued against PII. He further explained that the Leaders decided to take up the matter with the President as they believe the situation now warrants issues far beyond purely engineering and technical discourse. 1. The road construction project is a significant factor at the center of the State's budgetary landscape. Removal of this factor without certain and immediate replacement will drastically impact the budget. 2. Contracting of another company to replace PII may potentially take a long time before actual ground work is resumed. There is no guarantee that the next contractor will “do a better job”. President Mori expressed his appreciation of the difficult situations regarding the whole complex Weno road project saga. However, he highlighted that the President does not and should not interfere in the implementation and professionally/technically-based decisions pertaining any specific infrastructure project. He further stressed that the underlying common objective shared by stakeholders was for the project to be brought to completion within an acceptable timeframe and that Leaders should, as much as possible, keep the project free of political weight. Senate President Mailo and Governor Elimo concurred with President Mori’s observations and spoke of the need to move beyond fault-finding and focus on how to securing project completion with as minimal adverse impact as can be. Senior PMU officials later joined the Leaders at the meeting to respond to inquiries. In the end, it was decided that PMU and PII will have another face-to-face and renegotiate with the instruction that PII should present in writing a “counter offer” detailing how it plans to execute the completion of the remainder of the project. The PMU will determine the nearest opportune time to meet with officials from PII and Chuuk State Officials to hash out how to best address everyone’s concerns. A recent press release from PMU states that PII has been provided a revised offer that extends completion date by 281 days beyond the previous completion date of November 25, 2013 and increased the project price by $1,761,076.07. PII has until December 6 to respond to the offer. The meeting between President Mori, Governor Elimo and Senate President Mailo availed the opportunity to also discuss other matters of importance including telecommunication reform and sport facility project. Governor Elimo and Senate President Mailo were accompanied by Mr. Jesse Mori, Director of the Department of Administrative Services, Mr. Johnny Meippen from the Chuuk State Attorney General’s Office, and the Legal Counsel for the Chuuk State Legislature. President Mori was assisted by Chief of Staff Leo Falcam Jr., with input from Mr. Bruce Howell and Mr. Dana Smith from PMU. A trip to Japan at this time? what for?